This Big Bore throttle body is designed to increase performance across the rev range. This is the best, smoothest flowing design on the market. Starting with the OE BMW body, many diameters were tested before we found one that gained the best performance while maintaining all OEM functionality and drivability. Larger, was not always better. When looking to extract maximum horsepower from a highly efficient engine, the entire intake track must be taken into consideration, and a balance needs to be obtained between all components. On the M50 / S50 series of engines, the engine has only one throttle to ingest large amounts of air. When you want maximum engine output, this opening must be properly enlarged so the engine is not 'choked off'. We offer both Big Bore OBD1 & ODB2 Throttle Bodies to really unleash the maximum output of your engine. Our throttle bodys are OEM units that are professionally cleaned, bored to 68mm, and air-flow transition blended, then equipped with new butterflies for maximum flow while keeping factory fit and pedal feel. Each throttle body is smooth in response and user friendly so its perfect on the street or track. Typically software upgrades are not required*. Bolt on gains in the 5-10hp range, with similar torque gains can be had. With other performance upgrades like cams or forced induction, even further WHP can be gained with this modification. A: We recommend using our bored OE body's when street drivability is key- such as daily drivers, and dual use cars that see mostly street driving. Q: Will I need software? A: Depends on your engine configuration. Most customers have not needed to retune, however some efficient setups that are ingesting serious air and are on the lean end of their tune may need software adjustments. Q: What is installation like? A: For 95% of customers, this throttle body will bolt on without issue. However, the larger butterfly does change the resting position of the throttle shafts slightly; because of this, and the fact that the TPS is not adjustable, we will make mention that if your car does not go back to the idle ECU map after install, that the TPS mounting may have to be slightly notched to assure that the TPS voltage output shows that the throttle is 100% closed. Q: What does this throttle body upgrade cost me in the end? 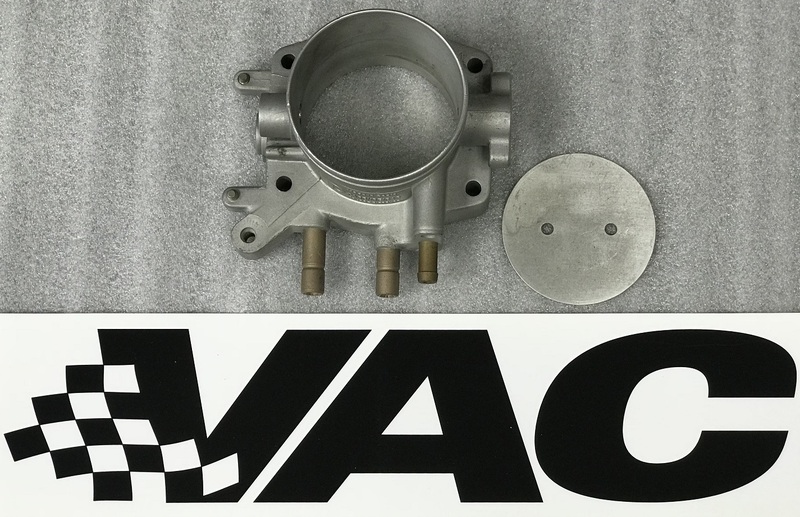 VAC Big Bore 70mm Billet Throttle Body BMW M50/M52/S50/S52 – A HUGE custom throttle body for maximum output.